Ordering one online was a whopping $35 so I was a little hesitant (although it’s obviously perfectly OK for me to rip apart brand-new PS2’s). However one day in line at Best Buy I saw some of the Radica Genesis’s for only $25! I immediately bought one. For some reason I couldn’t use the IC from a regular Genesis controller (didn’t work when I tried it) so I just carved out the IC glop-top from inside the Radica controller and used to make the built-in controller for my Exodus, as seen above. Here’s the front of the unit a little closer-up. 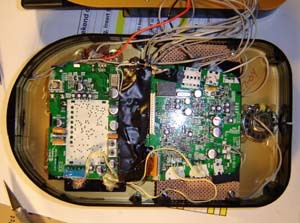 As you can see, only about 10 wires go from the back of the unit to the front. 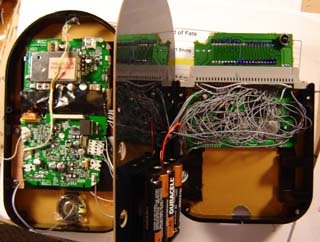 It’s a fairly simple system, aside from all the minute wiring on the Genesis board itself. Exodus from the side. The total size of the unit is 7.5″ x 4.5″ x 1.5″ thick. Uses less batteries (4 VS 6) and gets as much or more play time out of them. 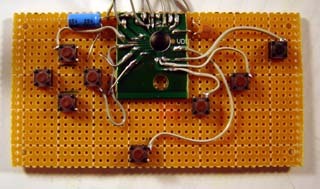 TFT active matrix (non-blurry) display. Helps with games like Sonic. 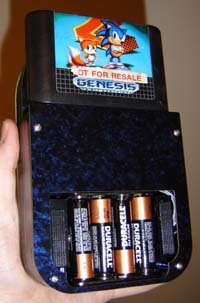 FUN BONUS: The pinout I came up with for attaching Genesis carts to the Radica can be found on the DOWNLOADS page.